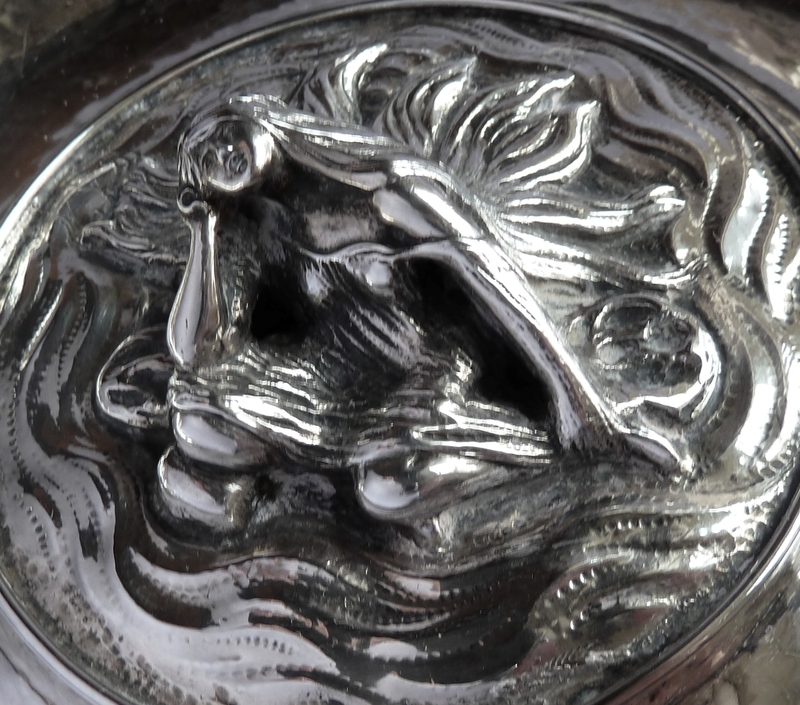 Of circular shape with “hammered” finish, the flared outer rim embossed with 4 shells amidst a band of flowing water around a plain sunken section enclosing a cast seated figure of a maiden with very long hair in wistful pose surrounded by further water. 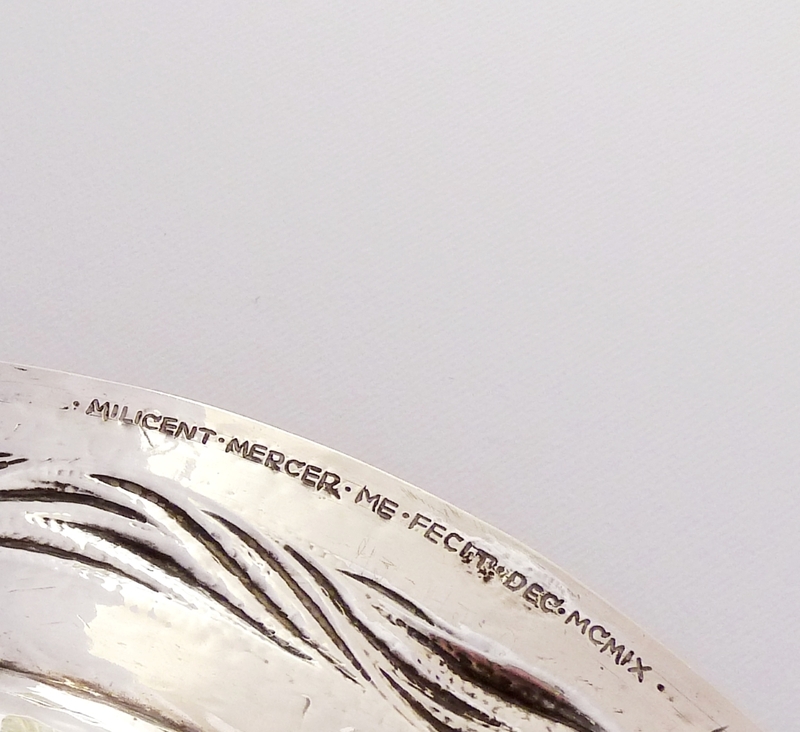 The underside inscribed “Milicent Mercer Me Fecit Dec. MCMIX"
This extraordinary dish is quite a conundrum. After many hours of research and help from a few scholarly friends we have unravelled part of the mystery. 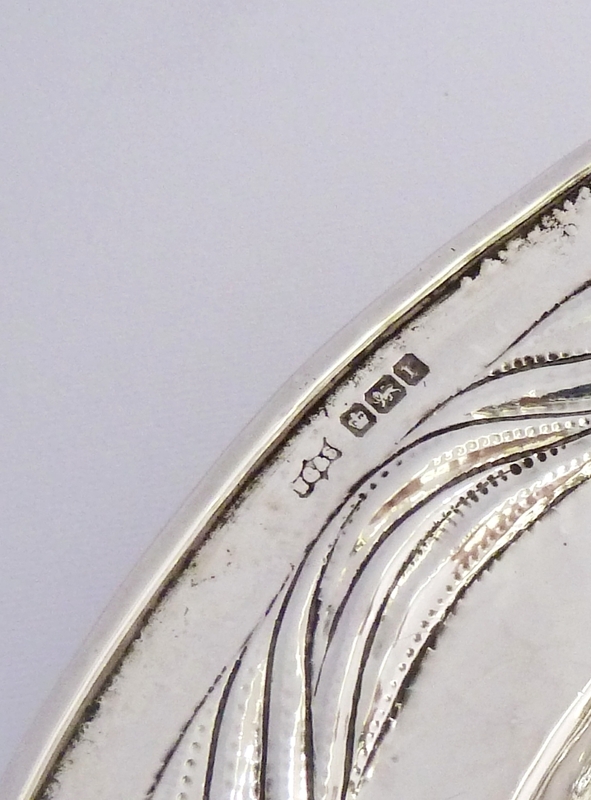 At first sight one would be forgiven for thinking it was made by Omar Ramsden and Alwyn Carr but the maker’s mark is that of a relatively obscure firm of Sheffield silversmiths, William Gallimore & Sons. Most interesting of all is the inscription on the underside “Millicent Mercer Me Fecit Dec MCMIX” . The Ramsden and Carr connection suddenly re-emerges as the text is the standard phraseology used by them during their partnership, even the style of the script is remarkably similar. So what is the connection between Millicent Mercer, William Gallimore and Sons and Mssrs Ramsden and Carr? The answer is The Sheffield School of Art. Millicent Mercer was a student there at the same time as Omar Ramsden and Alwyn Carr. In one particular year, possibly 1896, the list of prize winners sheds more light on a connection between the three: Under Modelling Design (Advanced Stage)- Excellent: Omar Ramsden, Alexander Crichton, Florence Green and Frank Footit. First Class: George Warr, Joseph Petch and Harvey Carr. Second Class: Alwyn Carr, Ada Beatson, William Banks, Robert Blackwell, James Walker, Ernest Kay, Millicent Mercer and others. Principles of Ornament (Advanced Stage) –Excellent: Alwyn Carr, Omar Ramsden and Millicent Mercer. The Sheffield School of Art was situated in Arundel Street, the same location as William Gallimore and Sons. 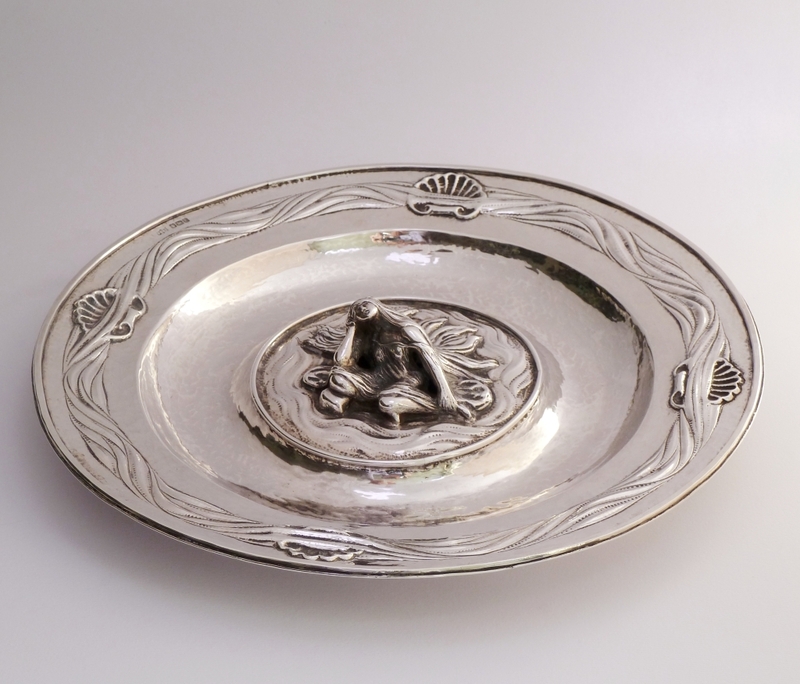 Technically the maker’s mark should be referred to as the sponsor’s mark and if Millicent Mercer had not entered her own mark at either Sheffield or London, there is a strong chance that she made the acquaintance of Gallimore’s and asked them to be her sponsor for this dish. Millicent Edith Mercer was born in 1876 in Gainsborough, Lincolnshire. She was the younger daughter of Henry Mercer (born in 1840) who married Louise Juliette Emerson. The Elder Daughter, Eleanor, had a very distinguished career having also been highly successful at the Sheffield School of Art. She exhibited at the Royal Academy, was commissioned to make silver for the Cowes Regatta and also featured in The Studio. The Metropolitan Museum of Art has a signed graphite drawing of a door knocker very much in the Arts and Crafts style. The 1901 census reveals Millicent was boarding in London and was described as a Designer and Chaser. The 1911 census states that she was living at 64C Fulham Park Gardens where she was entered as an Art Metal Worker. It is interesting to note that this address was under 1 ½ miles away from Ramsden’s studio at the time. At the present time we have no proof that she worked for Ramsden but the design, execution and signature are so similar that a connection after leaving The School of Art seems highly likely.